About Us ∣ Ted-Yue Precision Die Casting Co., Ltd.
Ted-Yue Precision Die Casting Co., Ltd. Originating from Ted-Yue Metal Co., Ltd. , we was established in 1983, specializing in precision aluminum/zinc die casting. For over many years of manufacturing skill and experience in die casting and moulds. Integrated operation is available from mold designing & producing, precision die casting, vary surface treatment - CNC processing, drilling & tapping, vibratory grinding and multi-color electroplating & coating- and assembling process to ensure the production of high-quality products and prompt delivery operations. We produce a wide range of aluminum & zinc die castings, from simple to complex designs, for example: LED/ lighting components, electronic components, auto parts & Industrial hardware components etc. we also provide the design and OEM services. In recent years, our performance is outstanding growth, plus, TEDYUE has been ISO 9001/2000 certified since 2007. We also set up one new business department for launch into the overseas market. Always progress in die casting technology and grow up profit margin for customers. We welcome your drawings, specifications, samples for price quotation or product development evaluations. We hope to be your most loyal and reliable partner. 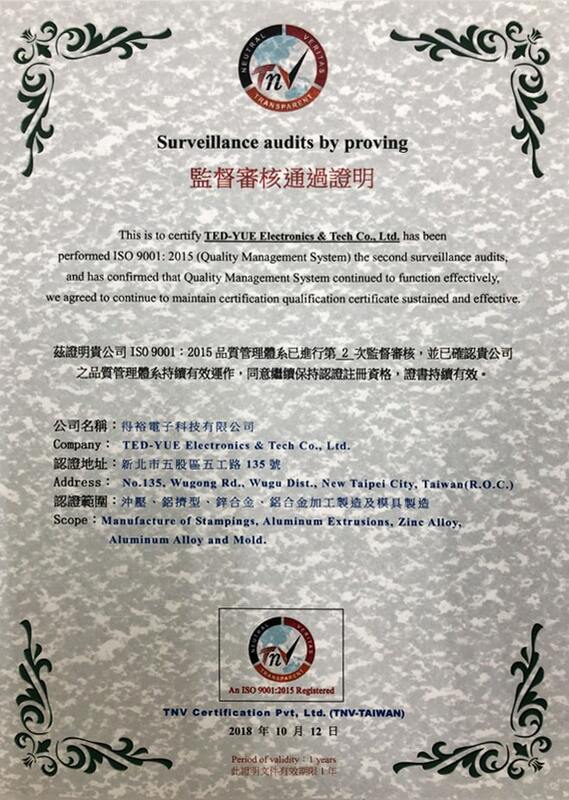 TED-YUE is certified according to Quality Management System: ISO9001/2015. Our in-house quality control department insures a constant flow of inspections, reports and updates to not only maintain tolerances and specifications, but to maximize the quality every step of the way.